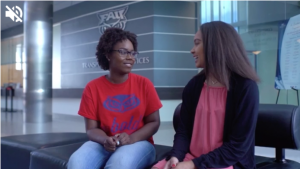 BOCA RATON, Fla– Neasha Prince is a junior at the Boca Raton campus of Florida Atlantic University and the first generation in her family to go to college, thanks to the Kelly/Strul scholarship program. “I have an older sister in a single-parent home, my mom worked three jobs. She immigrated from Haiti in her 30s,” she said. Less than a year ago, Neasha started an on-campus organization for first-generation students. It offers support as students get used to college life. “We pretty much just meet up and just talk. We talk about spring break, we talk about the things we want to endeavor, we talk about what we are struggling with,” she said. The organization, called First and Proud, meets weekly. “Join First and proud, we would love to have you. And at the end of the semester it grew to 500. And now since we are at our one year anniversary, we have over 1200 members,” she said. For video and full article click here.